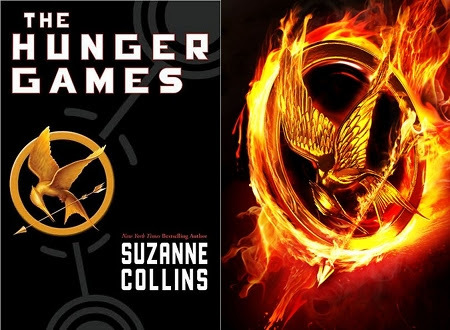 The Hunger Games: Book vs Movie – my books. my life. I, like most bookish people, saw The Hunger Games this weekend. So I thought it was time to resurrect the old Book vs Movie post. I’ve talked about the books many times and you can find my thoughts on the first book here. I am a big fan of the series so I was both excited and nervous for the movie. Turns out there was no reason for me to be nervous. They did an excellent job with the movie. There was very little I didn’t like about it. I thought the casting and the acting were fantastic, the cinematography was captivating, and the move remains pretty true to the story (I accept that some changes are necessary and my only complaint is that the District 11 signal was introduced so early by District 12). The movie gives us more of a look at what is coming in the series than I remember in the book. For example, we see discussions between President Snow and the head Seneca Crane about quieting district rebellion and controlling the population. We have a broader perspective in the movie than in the books where the reader is tied to Katniss and her limited knowledge the entire time. Overall, I was really impressed with the movie. Now, when can I see Catching Fire? I loved the movie. I did not like the book as much as most, but I was incredibly excited to go see the movie anyway and it did not disappoint. I’m glad to hear you were not disappointed by the movie. I finished reading the book on Saturday and I enjoyed it very much! As I finished The Hunger Games I just wanted to order Catching Fire at once. 🙂 but I’m still trying not to buy too many books (it’s an hard resolution to keep). I can’t wait to read the other books from the series and see the movie. I am planning on seeing this one on Sunday, as we weren’t able to make it this past weekend. Everyone who saw it says that it seemed to be a pretty faithful adaption, and that the casting was good, so I am excited! Is it true that there wasn’t much chemistry between Katniss and Peeta? I actually blogged a lot about the movie yesterday because I thought it was incredible. I had no expectations going in simply because I didn’t expect much from the film company. I was very surprised and pleased. We all loved the movie. Jennifer Lawrence was a spectacular Katniss…beautiful without being too showy or simpering. I would bet money that the kids will want to see it again in the theaters…spring break is only a couple of weeks away. I thought the movie was amazing! It’s so hard to live up to the book fans’ expectations, but I thought they did a gerat job.